The SEND Computing Conference took place onthe 30th November and 1st December at the National STEM Learning Centre in York. You can read about the Monday evening session on assessment and Ian Bean’s keynote in Part 1 of the blog here. Matthew Parry, a Computing At School Master Teacher in Derbyshire, led this session on creating Scratchy programs that can be controlled through whole body movement using a Kinect sensor. Unfortunately I couldn’t be in this session, but the feedback was great. He used a piece of software called Kinect2Scratch, that allows the Kinect controller to send data to Scratch. Kinect2Scratch was developed by Stephen Howell and is available at http://scratch.saorog.com. This means you can build games such as a Keepy Uppy Football game, or Popping Bubbles game, where students use their body to control the activity – ideal for those with poor motor skills. Older students can be tasked with creating games for younger pupils using this. You can see Matthew’s resources for the session here. Sue Finnigan is a consultant for the Sheffield eLearning Team, and has worked closely with the eSafeguarding Strategy Manager in Sheffield to create an Online Safety Curriculum for schools. She spoke about the work currently being done to create an appendix for students with special needs, which included reporting back on focus groups conducted in a number of special schools to find out what young people with special needs are doing online. For more information about the project, please contact her on sue.finnigan@sheffield.gov.uk. 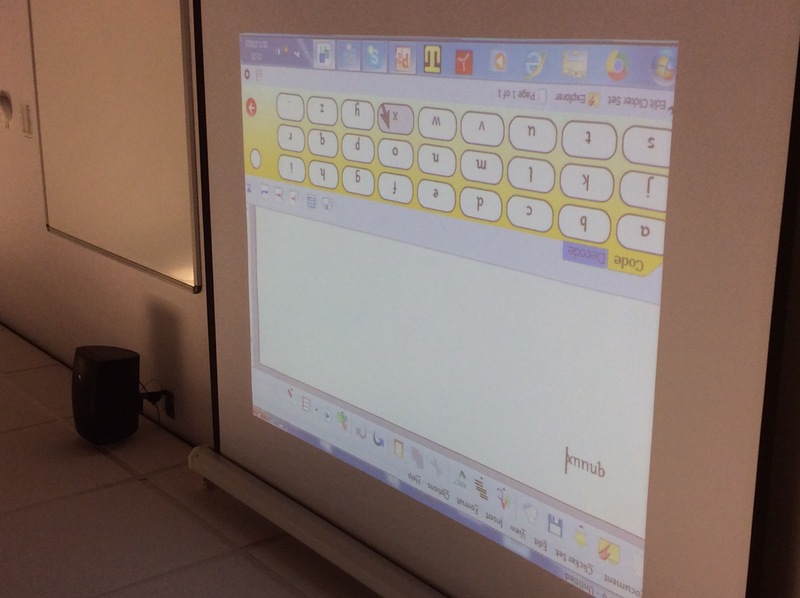 This session was led by Carol Allen, who is an Advisory Teacher for ICT and SEN in the North East. This was a fantastic session looking at computational thinking and how you can teach this to students with an emphasis on communication, fun, and physical movement and touch (something many pupils shy away from) – and not a computer in sight. We used hula hoops and physical tou ch to sort ourselves according to birth date; IKEA placemats to create an algorithm on the floor that could be followed, including dance moves and songs to sing; and flowcharts to illustrate how to play What Time is it Mr Wolf? including repetition and conditionals (selection). She has also used Clicker to create a working Enigma machine, that will encode and decode messages (with Claire Graham). Lots of ideas and she really emphasised the importance of creating relevant useful activities for SEN students. This was my session, and I wanted to give delegates an overview of options for moving students on from using the Bee-Bots for creating programs, and how support this. There is a list of links here for the session. Pro Bots – many teachers admitted to having these in a cupboard, but not really using them to their full potential. You can teach repetition, procedures and sensors – they have light, sound and touch sensors that canbe programmed. This is great for having an immediate, physical output for your code, and is based on the Logo language, so is transferable. 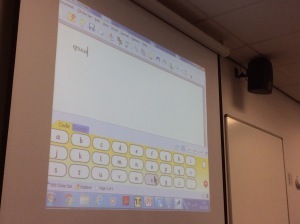 Scratch – an excellent programming tool, that can be used to create far more than games, e.g. music players, maths quizzes, animated stories, art generators. The main barriers are that it requires a certain level of literacy to read the command blocks, and the sheer number of command blocks. To aid with this, you can use a limited selection of laminated command cards to plan out a program in advance, or some live action programming to control a live sprite to move, change costume, play sound etc, in order to model parts of code. 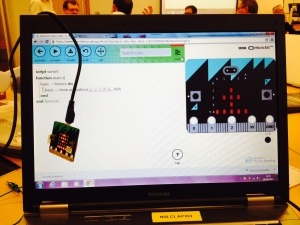 It also helps to give students ready-made Scratch programs to investigate, remix and debug. You can find Scratch command cards to print out here, and some SEN Scratch Resources here on our website. Kodu – This is a nice piece of free software that can be used to create 3D worlds without a great understanding of programming, and is ideal for older students working at lower levels. The programming works on a When… Do… principle – e.g. When arrow keys pressed, Do move around. There are a number of tutorials, both in the software itself and on the website (http://www.kodugamelab.com/). It is also compatible with the BBC micro:bit, which can be used as a controller (once they finally arrive). BBC micro:bit – Every year 7 is eligible to receive a micro:bit device this academic year. Delivery is delayed, but they should be arriving in the Spring term. If you’ve not registered your school, go to https://www.microbit.co.uk/ and sign up. These devices have a 5×5 grid of LEDs on them, and can be used to create simple animations, or broadcast a message, as well as creating simple games. You can have a go on the simulator on the website, and watch the videos to see the possiblities. I have written about these in more depth here. Ian Bean, an Independent Special Needs ICT consultant and trainer, showed a number of apps that can be used for teaching programming. Again sadly I missed this session, but I believe it was very lively, with lots of good things shown. There is a list of useful computing apps we recommend here. Huge thanks to all of the presenters and Gemma Taylor at the National STEM Centre, but also to the teachers and TAs who came and made it a really interesting and enjoyable two days. To carry on the conversation, and see some more links from the conference, visit http://sencomputing.wikispaces.com/ and click on SEND Computing Conference in the menu on the right.